The topic of Gelcoat is often a mystifying subject for boat owners. Aside from the durable shiny luster gelcoat adds to any fiberglass boat, most owners know little more than wash and wax it frequently. If you are looking to do some DIY gelcoat repairs, this brief primer will help achieve adequate repair. The following will help you gather all the necessary supplies, select the right conditions and finish with an acceptable repair. There is no succinct short answer for gelcoat, it is an art that takes some experimenting to perfect. But you need not be an expert to make a simple repair. These simple guidelines will get you started. A little trial and error is all you need to make those blemishes disappear. Boat builders start with a permanent fiberglass mold that is supported by metal on the outside (to make it structurally sound) and on the inside, a gelcoat over top of the fiberglass to make it smooth. When making a new fiberglass piece from the permanent mold, the mold is covered thoroughly with a release wax. This allows the newly laid molded boat part to pop out once cured. After waxing the mold thoroughly, a polyester-based material called "gelcoat" is sprayed on every square inch of the mold. The fiberglass laminate is laid in over this. Thus, when popped from the female mold, the gelcoat becomes the exterior finish. De-wax an area twice as large as the diameter of the repair with lacquer thinner or dewaxer. Wipe solvent on with a clean paper towel, rag or scotchbrite pad and immediately follow wiping dry with other hand before solvent flashes off. Apply tape around the perimeter of the de-waxed area. Roll/fold the edge on the work side of tape back to make soft blended edge. Use masking paper to protect the boat from overspray. If there is a molded bodyline or corner near the repair, you may want to extend the color patch to that point. The same is true for a painted or vinyl stripe. Sand the entire taped off area out to the tape line with 320-grit paper. This total area will be gelcoated. For scratches and gouges, a conical or spherical rasp that fits into power drill works well. Grind out the scratch making a V notch to increase bonding area. Be sure to sand away any loose chips. If damages cover a broader area, use a coarse 80 grit to grind out the area in a shallow bevel, thus increasing bonding area. Deep repairs that are beyond the superficial scratch will need some filler before gelcoat application. For small scratches Cabosil mixed with the gelcoat to a peanut butter consistency will suffice. For larger areas the cabosil mix will shrinkback and mudcrack, so instead use an auto putty body filler or thickened epoxy. Be sure to let filler cure fully and remove any blush with a wetsand. Determine the gelcoat batch size for the size of the repair--approximately 80 square feet per gallon of gelcoat (20 sq. ft. per quart. 2 sq meters per Liter). Tint the batch of gelcoat to match the color of the boat. If the boat is fairly new and the manufacturer is still in business, you may be able to get gelcoat that will be a very close color match. If this is not an option, you will need to purchase the gelcoat resin. We offer white and neutral colored gelcoats and colored gelcoats. 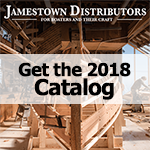 These gelcoats sold at Jamestown Distributors have wax additive unless otherwise stated, meaning other patch aid type additives are not required. Select the base gelcoat that is closest to your existing color and then tint to match. For this, you will also need pigments (called Epoxy Gelcoat Coloring Agents) to tint the base color to obtain a good match. We do not offer the patch additives. Instead, we recommend using the gelcoat with wax additive already included in the resin. There are several gelcoat patch additives that, when used properly with gelcoats without wax additive, make matching a repair easier. These are clear, low-viscosity resins which are not air inhibited. These products are mixed with the pigmented gelcoat in place of a wax solution to provide a tack-free cured surface. They also provide the added benefit of thinning the gelcoat without changing the color of the cured patch the way acetone or styrene can. A simple gelcoat repair kit is available for small, simple repairs. Matching the repair color to the color of the boat is probably the hardest part of the entire job. Best matches are achieved in bright daylight. Professionals workshops often rely on a sun gun to simulate true daylight. You will find that most gelcoat colors change as they cure. As you tint the gelcoat to match, apply a small amount of uncatalyzed material to the sanded area surrounding the repair. Use your gloved finger to spread this into a sample the size of a quarter. Wait a couple of minutes for the solvents to flash off. Any color variation will be evident. If the color match is not acceptable, change the color by adding small amounts of tinting pigments. As you adjust the gel coat color, try to think in terms of the basic colors, i.e. ; the color needs to be blacker or redder or bluer or greener... This will help you identify which of the pigments to use. Use very small amounts of the pigments. You may even need to dilute the pigment with white gelcoat to weaken the effects. Apply an uncatalyzed smear with each change of color no matter how small. Leave each of these smears on the surface until you have the color as close to the boat color as you can get it. When you are satisfied with the color match, wipe away all of the test smears with acetone or lacquer thinner. Divide the batch into a 2/3 portion and a 1/3 portion. Mix the 2/3 portion of matched gelcoat to desired consistency. If spraying, a styrene thinner is best to dilute the viscosity for spray application. Mix in catalyst following the recommendations of the gelcoat supplier. Over or under catalyzation may prevent the product from reaching a proper cure. Apply this mixed gelcoat to the surface of the repair with a spray gun or foam brush. Apply several light coats, feathering each one farther from the repair area. Allow the solvent to flash off between coats. You may need to apply five or six coats to hide the shadow of the repair. Most gelcoats colors will dry lighter in color if they are too thin. Most manufacturers recommend a total film thickness of 15 to 20 mils. A common mistake is to apply two or three heavy coats, causing solvent entrapment and improper curing. This may also have an effect on the color of the cured repair. For Isophthalic, NPG gelcoat with wax additive for an air dry post applied application, sold by Jamestown Distributors. Mixing instruction depends on the temperature and preferable dry times. The higher percentage of catalyst the faster it will dry. Air and surface temperature will also affect the drying of the gelcoat. The colder the air temperature, the higher the percentage of catalyst you should use. Do not go below 1/2% or above 2%. Only catalyze slightly more than needed. Resin that cures still in the mixing pot is unusable. Make another mixture with the 1/3 portion of gelcoat and thin to desired consistency, and again add catalyst. Spray the first coat of this mixture over the previously sprayed area. Then apply two or three more coats of this mixture over the entire area. Extend each coat farther than the previous one, with the last coat out to the tape line. NOTE: Gelcoat can also be rolled or applied by foam brush in patch areas, but spraying tends to yield best results with the least amount of followup sanding. Once the gel coat has reached a full cure, progressively sand the area to a polish. Start with 320-grit wet or dry paper. Pull the tape and sand the tape line smooth at the 400 grit. Continue to lightly sand up to 600-grit. Sand the surface of the repair if necessary. Buff the surface with a white, medium-cut rubbing compound. Take your time and do not overheat the surface while buffing. The excess heat can cause a stain which will be very difficult to remove. Finish with a fine compound and wax the area. There are times when the repair will not match simply because the original gelcoat color has faded. You may need to polish the entire side of the boat to restore the original color. Patience and experience are the two most important ingredients for a well matched color repair. The mixing of the color is guaranteed to teach patience. And since you may need to try more than once for a proper match, the experience comes quickly. So grab your gelcoat and get mixing.